Peace on Earth! Advent is here! Sunday, December 1st, the global Church recognizes the first day of the season of Advent, a time to remember Christ’s arrival to earth and look forward to his second coming. Advent lasts for the four weeks leading up to Christmas day. It fills me with awe to think that all over the world, Christians from many different traditions recognize the miracle of Christ’s first and second coming, all at the same time. The majority of my church experiences have not included advent - I do not come from a liturgical tradition. However, in the last several years I have found that celebrating Advent in my home has made the Christmas season more reverent, meaningful, and joyful. I’d like to share with you some of the more practical and meaningful ways we’ve woven Advent traditions into our home, in the hopes that it might help you as it has helped me as we resist the hectic tide of commercialism during the Christmas season. The heart of Advent is to take a few minutes each day or each week in December to slow the pace of our lives and recognize what God has done, and what he will do, with the miracle of Christ at the center. In this effort, tools like short scripture reading plans, songs, or advent calendars can help engage our minds, hearts, and bodies. You could something each day from Dec 1- Dec 25, or on the four Sundays leading up to Christmas day, with something special on Christmas Eve and Christmas day. It’s your home, so my hope is to inspire you with ideas so that you are able to put together something that works for your family. One of my very favorite daily Scripture reading plans can be found in the short book The Voice of the Psalms, published by Ecclesia Bible Society. In the beginning of the book, it has an Advent reading plan with daily readings from the Psalms that focus on Christ’s coming, with Messianic quotes from other parts of Scripture. It only takes 5-8 minutes a day, and scripture selections are fantastic. (Confession: I don’t always get to it every day ... sometimes Jack and I have to play “catch up” and read three or four days at a time ... but it is always worth it!) Together, the readings present a sweeping picture God’s story of redemption in Christ. It is available from Amazon or at Family Christian Bookstores (call before you go, they might be out of stock!). One of my favorite bands, Page CXVI, will release an album of Advent and Christmas hymns on Tuesday, December 3rd. You can hear a preview of it here. For me, it’s a challenge to find Christmas music that is both meaningful and enjoyable to listen to. This album accomplishes both (as a Kickstarter backer, I’ve had the privilege of getting it a week early, and it’s been on repeat ever since!). It will be available for download on www.pagecxvi.com (and likely on iTunes as well). If you prefer a short devotional reading, this free, downloadable resource from Connection Church in Astoria, New York has devotionals for five days each week. 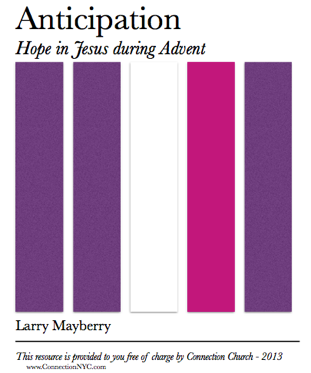 It was written by my dear friend Larry Mayberry, who is a pastor at the church. It contains meaningful reflections and stories, sweet hymns, and scripture quotes all put together in a self-contained format. It only takes 8-10 minutes each day, and might be more enjoyable if the idea of a scripture reading plan feels too intimidating for your home. As a child, one of my favorite Christmas traditions our family’s Advent calendar. Each night before bed, our excitement would build until it was finally time to unearth that day’s mystery as a little bear searched for the Christmas miracle (and finally found ‘Christmas’ with the family gathered in the living room). If you are looking for a high-quality advent calendar you can use year after year, I recently purchased (and love!) this wooden Nativity Advent Calendar. The small, hand-painted figures of the nativity fit behind small doors, and each day you can add to the scene until it is complete. It is well-made, sturdy, and beautifully painted. The back is magnetic so the figures stick quite well. It would also be quite easy to write short, daily scriptures on small pieces of paper and put them behind the doors as well to be read when you add the figures to the scene. For something more affordable, you can find a variety of Advent calendars that have chocolate or short Scripture verses behind each day’s “door” for $5-$12. Some of my favorites are made by the Vermont Christmas Company on Amazon, though you can also find them at the dollar store sometimes or at Christian bookstores. The Jesus Storybook Bible (which is lovely any time of year - I enjoy it even as a adult) can be used to tell the story of Christ’s coming when the stories are read in a particular sequence. You can find a free, printable reading plan and a description of how one mom uses the Jesus Storybook Bible during Advent with her children here. However you celebrate Christmas and Advent, I pray you will make deliberate space and time to celebrate the miracle of Christ’s coming as we wait together in expectation for what God has promised he will do. Merry Christmas, friends! *Note: I was not compensated in any way to share these items ... I just thought they were all great enough to tell my friends about! Back in Action in South Africa!